At least for members of the Boston-area building trades, the recession and Harvard’s belt-tightening are in the rearview mirror. Major projects under way during the frenetic summer season (see photo gallery above) included the wholesale reconstruction of the Kennedy School campus, beginning with excavation of the somewhat-sunken courtyard; it will be raised to street level, accommodating future kitchens, loading docks, and other utilities underneath. 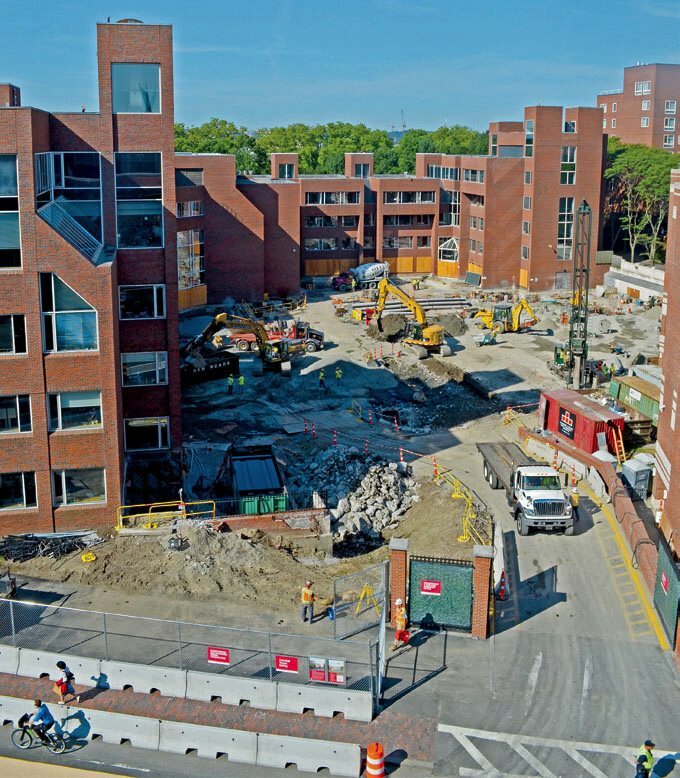 Across the Charles River, Harvard Business School’s Ruth Mulan Chu Chao Center, a replacement executive-education facility, took shape. The reconstruction of Dunster House, part of the College’s House renewal, drew to a close in time to welcome students back from swing spaces for the fall semester. Exterior work began on Winthrop House, to prepare for full renovation and expansion in 2016-2017. And in early August, scaffolding was erected to begin the exterior refurbishment of the former Holyoke Center, now the Smith Campus Center, in Harvard Square (not shown); pending regulatory review, it will be extensively renovated and, at street level, repurposed, and debut in 2018.